Jewish Catacombs of the “Vigna Randanini"
Below private property. Open to the public by arrangement with the Direction of the Parco Archeologico dell'Appia Antica (link) email: pa-appia@beniculturali.it - Photogallery (link). Overview (in English) of Catacombs' topography and development here (link). Jewish Catacomb of the “Vigna Cimarra"
Below private property. Click here for a site visit in 2001. In a public park. In restoration through 2018; for information on their opening in 2019, contact Dr. Daniela Rossi of the Soprintendenza Speciale Archeologia Belle Arti e Paesaggio di Roma - tel. +39.06-47788415; email: daniela.rossi-02@beniculturali.it (link). Overview (in English) of the Villa Torlonia Catacombs' topography and development here (link). Destroyed or inaccessible; for information, contact Dr. Daniela Rossi of the Soprintendenza Speciale Archeologia Belle Arti e Paesaggio di Roma- tel. +39.06-47788415; email daniela.rossi-02@beniculturali.it (link). Press release on a 2013 study and video. Via Casilina, opposite “La Certosa” (Casilina - Rome). 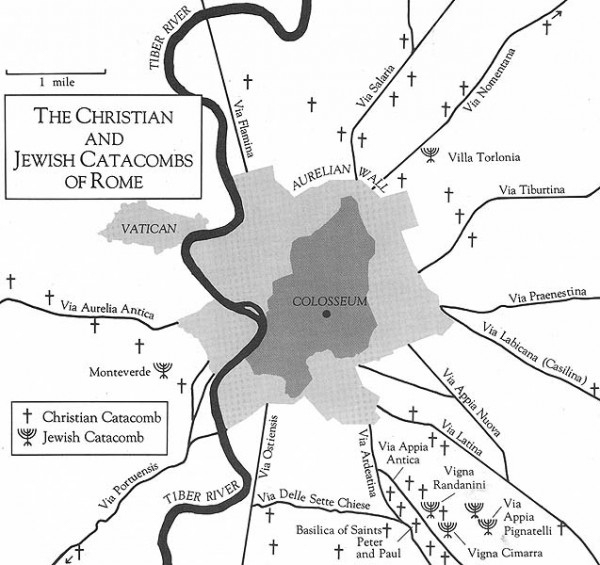 Click here for free study guides to the Jewish Catacombs and here for Bibliography on the Jewish Catacombs and Jews in Ancient Rome. Note: Jewish catacombs and individual burial chambers have been identified in other Italian regions south of Rome, including Venosa (PZ), Naples, Bari, Sicily, and Sardinia. Contact information for visiting these sites is here. Associazione Culturale Le Cinque Scole - Viale Giotto 25, 00153 Rome - Tel. +39.348.1224039 - http://www.jewishromecinquescole.com/w/ - E-mail: infocinquescole@gmail.com or procinquescole@gmail.com. 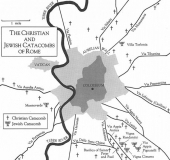 General assistance with visiting Jewish sites in Rome: Jewish Community of Rome Information Center (JewishInfoPoint), via Santa Maria del Pianto, 1, 00186, Rome; http://www.romaebraica.it; info@romaebraica.it: tel. 3288976222. Individuals and groups visiting Rome may also contact one of the authorized non-profit organizations, tour companies, and private guides listed below to schedule a private tour of the Jewish catacombs. Public, state-sponsored tours are held on occasion, and announced on ICS social media (blog,Facebook, Twitter, Google+). ItalyMe Tours: 06 20427871; http://www.italy-me.com/tour-roma-dintorni/tour-roma-sotterranea/. Tour organizers: Please contact info@catacombsociety.org if you would like to be added to this list (multi-lingual guides are preferred).